Child care training is a critical piece to quality child care for all preschool staff. 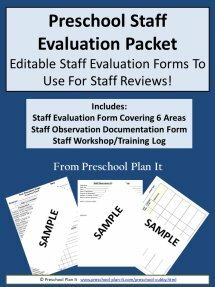 How do you decide on the type of training for your preschool program staff? Staff Training, Child Care Training, Staff Development: They are all phrases that mean the same. No matter what you call it, it is a critical piece to quality child care. Most states/provinces require preschool staff to participate in a set number of annual training hours. Teachers are always looking for workshops, conferences and classes to take to meet these requirements. As Early Childhood Educators, your staff is busy: busy planning and preparing and lesson planning and, most importantly, busy spending time with the children! How are child care trainings and continuing education courses chosen for your staff? Are you involved in the choosing of the continuing education that your staff participates in or are they chosen BY your staff? In many programs, the staff choose the trainings they participate in and submit the required paperwork to the director. In other programs, professional development goals are discussed and determined at a meeting between the staff and the director. I recommend the latter. 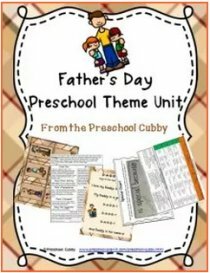 Most teachers in the preschool field want to grow and develop their skills in the field and want trainings and workshops that will help them to grow professionally. Some, however, will choose trainings and workshops that are quick, inexpensive and meet the annual requirements without looking for ways to grow professionally. As the Preschool Director, you are ultimately responsible for the quality of the care your program provides. The only way to be sure this happens is to be involved in the development of quality staff. You have an obligation and a wonderful opportunity to work with each and every staff member to help them grow in their chosen field! Let's look at what the staff learn through training and the types of trainings available. 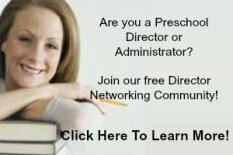 Are you looking for online Preschool Teacher Trainings? Trainings, at a minimum, meet annual requirements. However, they are so much more! Training helps each staff member to learn more about the field of early childhood education. Training helps staff members to connect as a team by participating in trainings together. Training helps to remind staff of the purpose, philosophy and potential of the field they work in! The purpose of training is to help the staff member stay current in the field of early childhood education. It helps participants to learn to teach in the way children learn. It helps them to learn new ways to teach the concepts and goals of your program. The philosophy of early childhood education is supported by training. Participating in training that is geared for the age group that the staff member works will will serve as a reminder of their preschoolers' abilitities. Trainings should be based on a solid understanding of preschool growth and development goals and milestones. They will see the potential of their OWN growth and development in the field! There are so many types and formats of training available for your staff. The first thing you must do is check your state requirements. Some states require that the training, workshop or the actual trainer be approved by the licensing division in your state. If this is the case, check their online list of approved trainings or trainers to find out what is available that will meet the professional development goals of each staff member. Some states simply require that the training fall under a list of core skills such as Curriculum Development; Professionalism; or Growth and Development. If you do not have plans in place for each staff member, begin meeting with them right away! Find out what areas they would like to learn more about (science, math, circle time ideas, growth and development, etc.). Observe them to see what areas of planning are not as strong in the classroom. This may help you see areas of needed development. 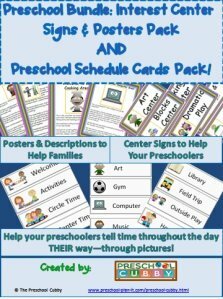 Develop Your Own Child Care Trainings! There are many types of trainings you can put together to offer! Many states leave the final decision to whether a training qualifies up to you, the director. Some states have an Independent or Self Study option for many of the hours. Or, you may want to require that staff participate in a training you offer simply because it meets the needs of the program and the staff--even though it may not quailify for in-service hours (just be sure to state in you preschool staff handbook that additional trainings are required under terms of employment). Put together a series of articles related to an area or theme you want the staff to develop in and present them for reading by your staff. When complete, ask them to submit a written review to you that includes what they learned, how they think the information will help them and to list 1-3 ways they will put this information into action in their classrooms over the next month. I am a huge fan of utilizing articles from Early Childhood News. They have a great array of them! Provide a copy of a book that is related to an area you want the staff to develop. Have them read it (give a deadline) and again, to write a review as stated above with reading articles. There are so many great books that will help your staff grow and develop! 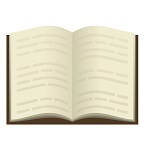 I've listed a few of my favorite staff training books below. Read one chapter a week independently. Discuss as a group once a week. Commit to one idea learned from the chapter to apply in the upcoming week and report back on it next week. This was highly effective and beneficial for us as a team because they were on the same page (pun intended!) with regard to that topic. If we were reading a behavior guidance book, the staff would bounce questions off each other. For example, if reading Postive Discipline for Preschoolers, when faced with a behavior issue, the staff would brainstorm what they thought the "goal of misbehavior" was for that child (a concept covered in the book). It allowed the group to better work together as a team. If reading a book about Dramatic Play or Outside Play, the staff would plan together based on what had been presented in the book. Check your area associations (NAEYC, AEYC for your state, etc. ), hospitals and other facilities for training opportunities. You may find there is a doctor speaking on AIDS in young children or a psychologist speaking about the impact of television on children. Many of these trainings happen at local hospitals throughout the year and many of them offer certificates of attendance. You might suggest that, as part of your approving the workshop or conference for hours, the staff member must present a 20 minute or 1/2 hour discussion or activity time to the staff at the next staff meeting to show what they have learned. There are many online programs that provide in-service hours for child care training. 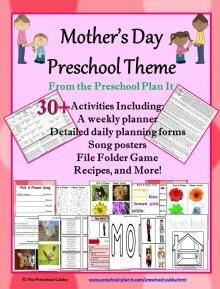 Here at Preschool Plan It! I offer two individual online preschool workshops (links above) that may also qualify for in-service hours in your state. Each workshop is a 4 hour workshop. Your staff member studies at their own pace-they have up to 1 year from the date of registration to complete the assignments (unless you have a time requirement for them to complete it). I do offer a certficate of completion. Click here to learn more about my workshops. I have took the Sensory Play workshop and really enjoyed it. In addition, Christine Moore (owner of Circle of Ideas) as added so many more trainings! She offers different hours for each workshop as well. I have taken several of these trainings over the years as well. They also have trainings to help you as a preschool director obtain the professional development hours you need. Don't Be Afraid To Require MORE Child Care Training Than Is Required! You CAN offer more training that your state requires as part of your program. Not for the sake of requiring more, but for the sake of requiring the growth and development that will result in high quality child care! The state requirements are a minimum. 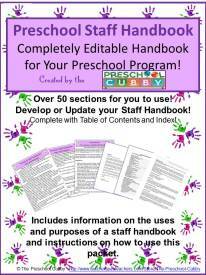 Your policy and preschool staff handbook should spell out what your program policy is. In our program, the state required that there be at least ONE person who is CPR and First Aid certified on the premises at all times. As a PROGRAM, we required that ALL staff be CPR and First Aid certified. Let's say your state requires 15 hours of annual, in-service training each year for teachers. Let's also say that your state allows for the CPR and First Aid training hours to count toward the total number of annual inservice hours for the teachers. AS A PROGRAM, you may require that all teachers receive 15 hours of in-service training in addition to their CPR and First Aid training hours. And yes, I DO recommend that you require this. CPR and First Aid is helpful and can be life saving but, let's face it, it does not help us or our staff to grow and develop in the field of Early Childhood Education. Remember that your program quality will only be as good as the quality development of your staff. Your teachers work with children because they love children! Help them to provide fun, engaging and developmentally appropriate activities as well as learn about the growth and development of the children in their care through child care training.